Ofield Dukes, left, is presented with honorary plaque by Kojo Bentil, Senior VP, Motown Records, which was Dukes' first client in 1969. At left is Alicia Evans, president, BPRS/NY. Nearly 100 members and guests attended the event Feb. 20 at Burson-Marsteller. PR counselor Ofield Dukes, who started his PR firm in 1969 after serving in the Johnson/Humphrey administration in the '60s, was honored by the Black PR Society of New York Feb. 20 as part of its celebration of February as Black History Month. Nearly 100 members and guests enjoyed Dukes' humorous recounting of his early days as a PR counselor in Washington, D.C., and his subsequent career working with and for many leading political and entertainment figures. His first client, Motown Records, presented him with an elaborate plaque decorated with a platinum record in his honor and pictures of the many famous figures that were his clients and friends. Dukes, who was an aide on the staff of Vice President Hubert Humphrey, said Lyndon Johnson was the president who fought the hardest for civil rights for blacks. Asked what motivated him to get into PR, he traced his development to the example set by his mother, "who was the epitome of Christianity" and who woke up every day "bursting with enthusiasm." Another reason for his success, he said, is that "I had a love affair with my work." He urged the audience to have confidence, work hard, and to excel at what they do. PR Society of America awarded Dukes its Gold Anvil last year, the highest award the Society has. He became the first black to receive the award in the 54-year history of PRSA. Dukes organized the PR curriculum at Howard University and later taught at American University. Besides his own firm, Ofield Dukes and Assocs., of D.C., he also founded the D.C. chapter of BPRS. Alicia Evans, president of BPRS/NY, called Dukes "a living legend and inspiration to countless communications professionals." Dukes "represents all that was possible during a time when major challenges could have easily altered his course," she said. 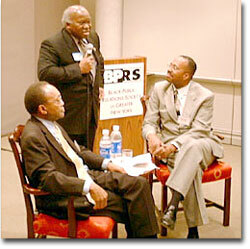 BPRS/NY, formed in 1989, has about 500 members. Dues are $50 yearly, and membership is open to all PR pros in the New York area. While Dukes may say it was Lyndon Johnson who fought the hardest for civil rights for blacks, he should remember that Johnson signed civil rights legislation after many, many years of activism and struggle (and beatings and disfranchisement and murder) of civil rights activists. Hooray for Ofield! He deserves this and more. Praise also goes to Burson Marsteller for helping BPRS of Greater NY by providing free office space and a great place for the organization to hold its events. As a Burson alum, I am also proud to be one of the founders of Burson's Multicultural Affairs Committee, formed back in 1993, which helped BPRS to find their current home. Great event BPRS! Copyright © 2002 J.R. O'Dwyer Company, Inc.